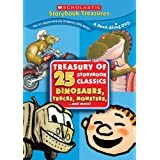 Scholastic Treasury of 25 Storybook Classics: The boys didn’t want to stop the stories from coming when I showed them our newest collections. Instantly attracted to Pete’s A Pizza, which they read at school, they loved seeing it animated. Also in the Dinosaurs, Trucks and More Collection: How Do Dinosaurs…, I Stink, Mouse and The Motorcycle… 21 other favorites. At 26.99, this is a great gift for a boy. Also newly available, check out the Fairytales, Magic and More, with 25 more classic stories including a Hans Christian Andersen collection, a James Marshall collection and, one of our favorite little witches, Tomie DePaola’s Strega Nona. Both are available on Amazon as a preorder, due to release May 19. Music to be released, also on May 19, Putumayo European Playground, which features 15 child-friendly tunes performed by various artists. A great pick to add to your collection, and to teach children about music all over the world. If your kiddos are loving the cute little Pinata characters featured in the former TV show (and now available on DVD), make sure to check out the newest installment: Viva Pinata: Lights Camera Action. Another TV to DVD sequel, Pucca: Super Sooga Squad was also released this spring. Cute animation for the elementary kids, this story features racing, more Kung-Fu and little crushes. Last month Rocknoceros released Pink, a very fun sing-along rock CD. The kids were singing along to this one in just minutes. Very fun. Beethoven’s Wig came out with their 4th installment recently: Dance Along Symphonies. The award winning series plays classical music, adding child-friendly lyrics. Making marches like Pomp & Circumstance a lot more exciting. Any parent or teacher who has attempted to find ways to teach kids to learn their mulitplication tables will be very jealous of this one. Finally, someone is making it a lot more fun. Hap Palmer’s Multiplication Mountain, I’m espeically a fan that every other track has answers missing, in that it repeats the song before but leaves beats to answer, so kids will naturally start to sing along but have to remember that 2 times 1 is ____. All of these CDs and DVDs are available at Amazon, where when you spend $25, you get free shipping.